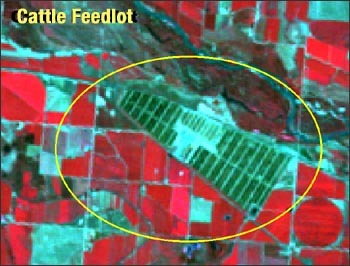 Landsat shows cattle feedlots for human health study. Human health scientists have associated cancer, neurological disorders, and adverse reproductive outcomes with exposure to agricultural chemicals. Lack of information on historical environmental exposure to these chemicals, for rural populations in particular, has hampered further study. The U.S. Geological Survey EROS Data Center, the National Cancer Institute, and Colorado State University are collaborating to use Landsat satellite imagery to identify land cover features such as specific crop types, irrigation practices, and large animal feeding operations. Studies of rare diseases like many cancers may cover large geographical regions, and often exposures must be estimated over several decades. The Landsat image archive is essential for reconstructing historical land cover information. Researchers are integrating land cover information with other environmental data (e.g., chemical use, hydrology, atmospheric) in geographical information system models to predict agricultural chemical exposure in human populations. Recent study areas are in the Platte River Valley (Colorado and Nebraska) and Iowa. This entry is filed under Human Health, News.